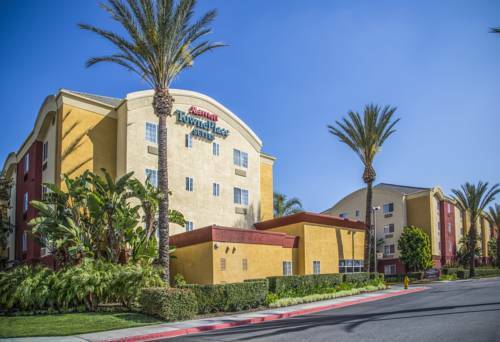 Experience the top hotel that Anaheim, California, has to offer extended-stay travelers, TownePlace Suites Anaheim Maingate Near Angel Stadium. Retire after a long day in one of our spacious suites, fully equipped with kitchens and free high-speed wired and wireless Internet access. Relax in the outdoor pool or stick to your fitness routine with full access to two on-site exercise facilities. Two laundry rooms are available for your convenience, and our hotel's location is just minutes from Anaheim Convention Center, Disney California Adventure and Honda Center. Taking in a baseball game is easy thanks to our close proximity to the main entrance of Angel Stadium. Enjoy shopping and dining at popular destinations like The Outlets of Orange shopping mall, The Shops at Anaheim GardenWalk and Downtown Disney. A food court with Starbucks and numerous fast-food options lie adjacent to our hotel. Our Anaheim, CA, hotel is also conveniently near UCI Medical Center and St. Joseph's Hospital.